Native art collector Bruce Colling shows off one of the pieces of his collection, which he has loaned to the Napanee Branch of the Lennox and Addington Library. The collection will be on display through September. Photo by Adam Prudhomme. 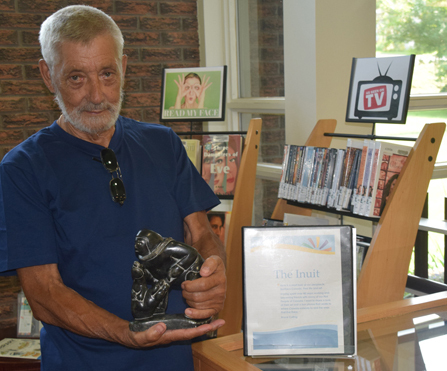 Given libraries are a place of learning and discovery, Bruce Colling felt the Napanee Branch of the Lennox and Addington County Library would serve as the perfect backdrop to display his collection of Inuit art. As such his collection, which he accumulated while travelling Canada’s territories as a buyer for the Hudson’s Bay Company, is now housed on the library’s second level. It includes soapstone carvings he purchased directly from artists in British Columbia, the Yukon, Northwest Territories, present day Nunavut and Greenland. “I thought it might be interesting for people to understand a little bit about the north, what the north actually is as opposed to Thunder Bay or North Bay,” Colling said of displaying a portion of his collection at the library. He’s also included as much information as he could gather on each particular item and the artist, as well as assembling a book of photos he took while living up north. The book also includes maps and general information about some of the culture of the Canada’s northern tip. The figures are also very much associated with nature such as carvings of narwhals, seals, wolves and other animals found in the region. A stark contrast to the rest of the collection is a piece he purchased from Greenland, which really illustrates the differences in culture. While Canada’s artists tend to stick with the realistic nature theme, Greenland’s art has a more spiritual motive. Colling was able to amass the collection while working for Hudson’s Bay as a buyer of fur. Originally from Scotland, his job required a lot of travel where he eventually wound up in Canada. He’d typically be situated in a community for a handful of months before being relocated to another part of the north. That allowed him to make plenty of friends in the Inuit community and get immersed in their culture. He hopes people who visit the library will take a look at the collection, learn about their culture and maybe shed some of the stereotypes of that region. The collection will be at the Napanee branch through the end of September.